Last night, the Academy of Country Music gave out some awards. No, I didn&apos;t watch—frankly, I wasn&apos;t even going to cover it on here until I saw the pics. And then I knew we had to talk. May I direct your attention to just three female celebs? There is the good (Taylor Swift), the bad (Carrie Underwood) and the... well, not ugly, but let&apos;s say problematic (Nicole Kidman). Basically, everything you want in an awards show when Monday morning beauty judgements are what gets you through. Did you just fall off your chair? I pretty much did when I saw this shot. After all the begging, pleading, nit-picking, wondering... WHEN is this girl going to ditch the twee side-bangs and heavy eyeliner and cherry lips? Finally she comes through. I feel like my work is done here. Let&apos;s talk about the hair first. I die over the colour—never thought I&apos;d support ashy blonde, but that&apos;s why you never say never in the beauty biz. The lengths have just the right amount of bend, and the bangs are the absolute perfect length, just grazing below her eyebrows. Damn, why didn&apos;t mine ever fall like that when I had a fringe? So obviously for the red carpet, the makeup is heavier than what you&apos;d wear in real life. But I think she&apos;s done a nice job on the base, which still looks pretty natural, and I love that peachy blush colour. While I could do without the false lashes, what&apos;s great about the eyes is that bronze shadow both along the upper and lower lash lines. SEE: if there&apos;s one new eye makeup thing you invest in for 2012, I do believe it should be something bronzey (shadow or liner). I&apos;m detecting a hint of visible liner on the bottom lip, but other than that, I approve of the colour, and appreciate that it&apos;s not too glossy/goopy. Oh, and I appreciate it even more—ALL of it—when I look at this photo of Carrie. Is that a country music singer or the new star of some new Hugh Hefner Girls Next Door show? I&apos;m serious. How is that Kendra (for example) has better hair and makeup than a legit celeb like Carrie? 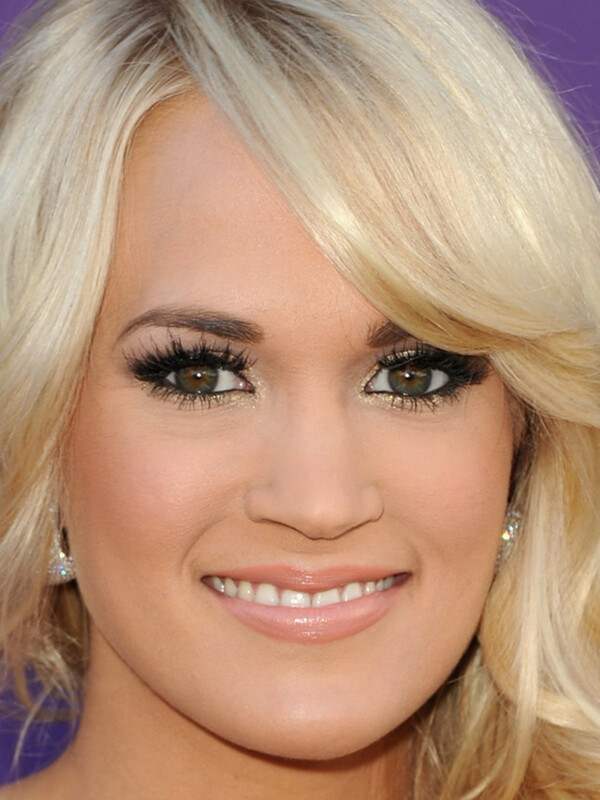 It kills me because underneath it all, Carrie is actually quite pretty. But I guess all the money in the world and a hot hockey husband still doesn&apos;t make you realize you need to fire your "people" and get proper makeup and hair help. Speaking of the latter, let&apos;s just touch on the colour for a moment. It&apos;s obviously too light for her skin tone, although admittedly, it&apos;s hard to tell with all that makeup on. It&apos;s also two tones: more platinum at the top (and I dislike that shadowy part at the roots), and more brassy at the bottom. Colour correction needed, stat! It&apos;s a MASK. I feel like you could peel it right off and then we&apos;d all be relieved it was just a bad dream or an April Fool&apos;s joke. The thing is, she doesn&apos;t have bad skin—she&apos;s a spokesperson for Olay, for crying out loud—so I don&apos;t get the need for all this foundation. Same with the overly penciled, too-dark eyebrows; harsh black eyeliner; full false eyelashes; and mega-glossy lips and lip liner. It ain&apos;t cute, and someone needs to take a cue from Taylor Swift on how to do red carpet makeup. It&apos;s not so much the hair (although it IS bad), or the makeup (which is fine). It&apos;s the FREAKING LIPS. Do you understand this? Because I don&apos;t. I mean, I know there&apos;s some kind of injectable at work there, and has been for a long time... but why is it curling like that, and crookedly, and showing so much of the gum line?? If anyone can enlighten me, please do. Are you as blown away as I am with Taylor Swift&apos;s look here? 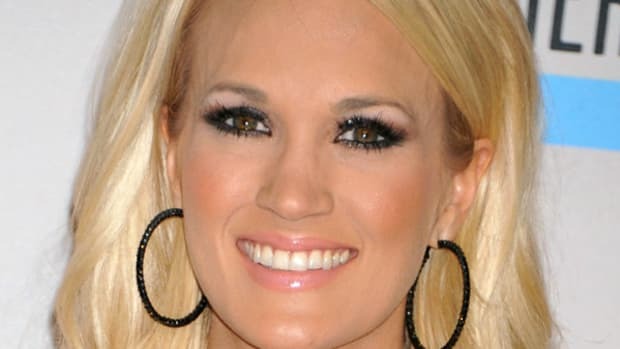 How much do you want to chase after Carrie Underwood with a makeup wipe? What do YOU think is going on with Nicole Kidman&apos;s lips, and why is she okay with letting them out in public?